Jacques Non-Contact Visits System (NCV) allows prison visitors to communicate with individual inmates with no physical contact. Separated by a glass or perspex barrier, visitors and inmates are able to communicate using a pair of intercom terminals (hands-free or handset options available) on either side, without physical contact. The system simultaneously records all conversations between visitors, inmates and operators. 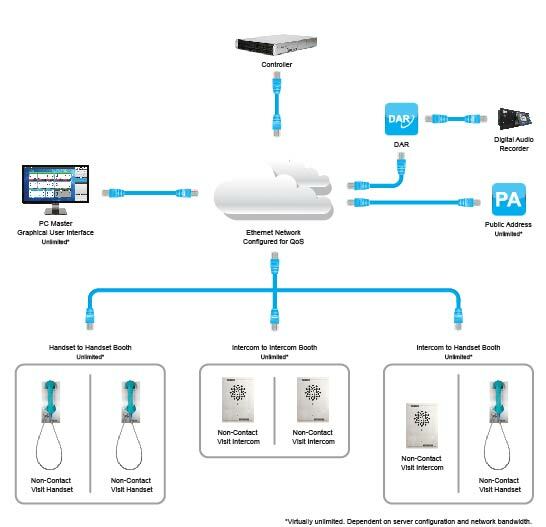 Communication over intercom booth pairs are supervised using the Non-Contact Visits System graphical user interface (GUI) ensuring ultimate call control and flexibility. 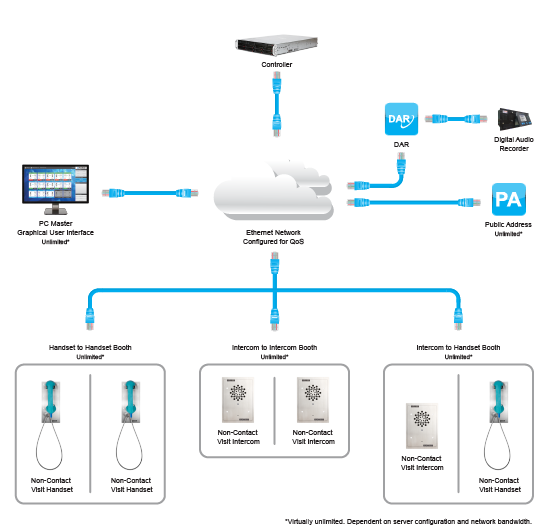 The NCV GUI also facilitates group or single endpoint public address announcements, intrusion and instant playback of recorded audio files and call monitoring from any master station within the network, ensuring a cooperative prisoner visiting environment. The Jacques Contact Visit Systems allows for the covert monitoring of prisoner communication discretely from within a common environment. In prisoner communal seating areas such as the mess hall or in public and prisoner meeting rooms (allowing contact) monitoring, recording and intruding on conversations between parties may be required to ensure prisoners uphold a level of law-abiding behavior. Often covert monitoring devices are concealed within each table and perform ‘listening’ functions. Management of the CV system is via a dedicated Contact Visits system Graphical User Interface (CV GUI) and is used by the supervising authority to perform various covert monitoring functions including monitoring/listening. The Jacques NCV System and NCV Graphical User Interface provides a safe and reliable solution for prisoners to meet with visitors without making physical contact. All booth conversations are automatically recorded and available for instant playback. Vandal resistant intercom terminals including hands free and handset versions. NEED A PRISONER VISIT SYSTEM?